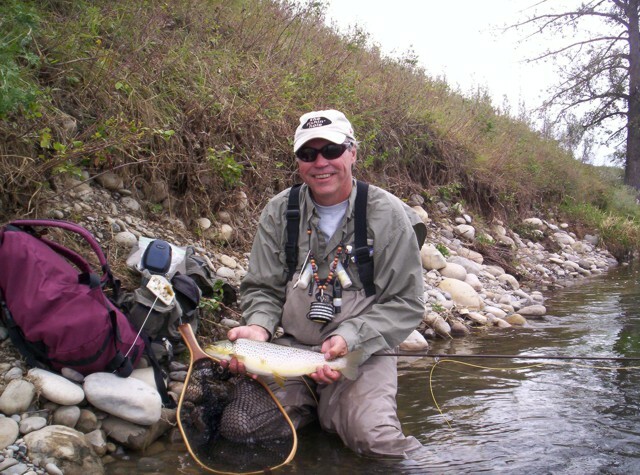 Fly fishing has been a big part of my life for many years, I have guided, taught fly fishing schools and fished for pleasure in many different parts of the world, yet every year I learn things about the sport that I never knew. That's one of the most enjoyable parts of the sport, you're never finished learning. Here are few things I've learned along the way that may help you become a better fly fisherman. Being prepared for your trip, whether it be a two hour, two day, or two month long trip is one way to help you have a good fly fishing experience. There is nothing worse than arriving at the water and remembering that you left your gear in bad shape at the end of your last trip. I am guilty of this and it’s the one thing that I am going to concentrate on changing. It's very easy at the end of a day of fishing to say I'll change that leader, fix that broken wading shoe lace, clean my reel etc... when I get home, and then put it out of your mind, until you pull it out at the start of the next trip and are faced with the mess. One of the biggest mistakes I often see anglers make is that they rig up their rods and choose their flies in the parking lot. I never rig up until I'm at the waters' edge, no matter how well I know the water I'm about to fish because too many things can be different than the "last time". There may be a hatch on with fish rising everywhere and there you are with two nymphs and a strike indicator tied on. One time on the Highwood River, one of my favorite cutthroat streams, I parked on the road and rigged an eight weight with a sink-tip line and tied on a large, gaudy streamer because today I was after a large bull trout, and I do mean big, that tried to eat a little cutty that I had on the line the day before. 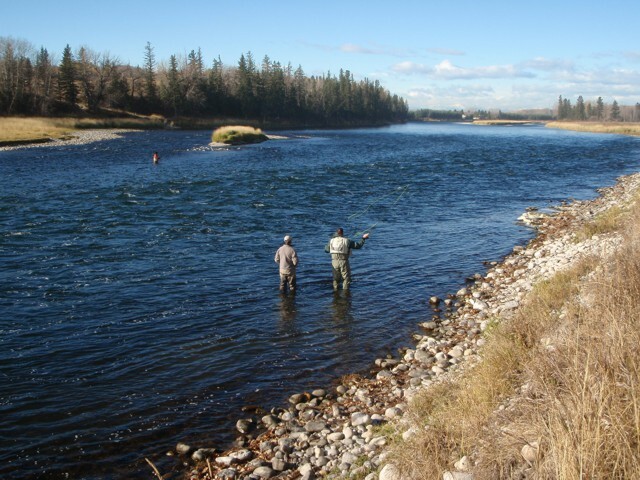 Upon arrival at the water there were two other anglers standing on either side of the pool chucking streamers into the depths of the only deep pool in miles. There I stood loaded for bear and nowhere to fish, back to the vehicle for the dry fly set-up. Practice makes perfect they say and fly fishing is no exception, there is always something you can work on. Everyone can get better at casting, add more distance, improve accuracy or improve their roll cast. Mending can be an essential part of fishing moving water, especially in mid to larger sized rivers, yet many anglers do it poorly, if at all. Mending can be the difference between a drag free drift that fools that brown tucked in against the bank and a flubbed drift that puts him down. So the next time fishing is slow instead of a siesta in the shade why not practice your casting and mending. Being comfortable is key when fly fishing, after all it’s supposed to be fun. Make sure that you not only have waders and boots that fit properly but also that you are outfitted with the necessities. Fly fishing is one of the most gadgety sports out there, a lot of the things we accumulate are nice to have but aren't really crucial to success. Things that you should have for your comfort and safety should include water for hydration, like all sports that take place on the water dehydration can sneak up on you very quickly. If you wade rivers and streams that have tricky wading think about investing in a wading staff, the good quality ones are multi-pieced and fold up out of the way and are there when you need them. They are handy not just for crossing streams but also just for moving from spot to spot. Lighten the load, I’m notorious for this and have tried my best to pare things down to what’s necessary, a prime example of this happened to me a couple of years back. I was fishing the Livingstone River and had started using a backpack instead of a vest or a chest pack. While rifling through it looking for my box of dry flies I found a fly box full of saltwater patterns, Crazy Charlies, Tarpon Flies, and crab patterns. I also found another box full of Pike flies in there, mice, Dahlberg Divers etc... as well wire leaders and heavy duty pliers designed for saltwater fishing. All utterly useless and adding on weight to an already unnecessarily heavy pack. I've never seen the fascination that some anglers have with fishing the same spot with the same methods over and over again. 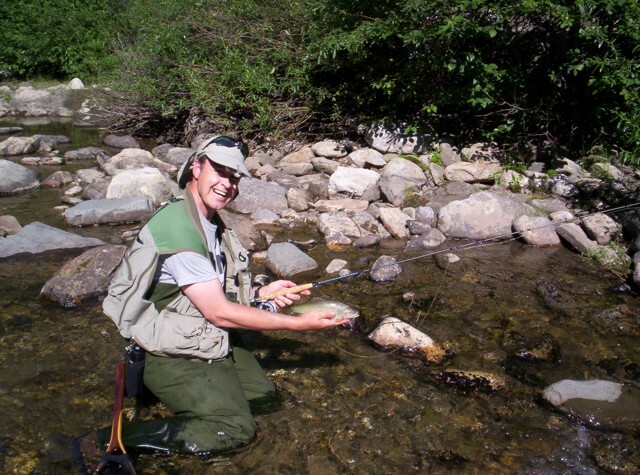 I was probably guilty of this when I first started out fly fishing, when I finally figured out how and where to catch a Stauffer Creek brown I frequented that spot and fished the same flies. I saw this over and over in Calgary with walk and wade anglers. 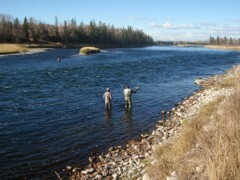 They would fish the same holes with the same flies and catch the same fish over and over. While I can sympathize with anglers that have limited time and want to catch fish but the only way you'll ever grow as an angler is try new places and figure out where and how to catch these other fish. Tradition plays a large part in our sport but things change, sometimes for the better, sometimes for the worse. The advances in equipment quality and availability at a reasonable cost these days is staggering. When I say think outside the box I don’t mean big things like equipment but rather little things. As an example I learned a long time ago that sometimes you have to UNMATCH the hatch in order to be successful. I first started doing this during Trico hatches, these mayflies are not only small but prolific and it's all but impossible to get a fish to eat your fly over the thousands of naturals on the water. If he does eat your fly it is almost impossible to tell he ate your fly and not one of the naturals on the water. I started using a totally different fly, in this case a red ant, which fish are used to seeing and eating. The fish would quite often forego the Trico’s and eat the red ant, which I am able to see and set the hook. I still use this trick quite often, especially during heavy hatches, ant or beetles are my favorites. Another "outside the box" thing I’ve started doing is using very small ball bearing swivels on my nymph rigs. Fly fishing purists may shudder at the thought but I find the small swivel works extremely well when nymphing. By adding tippet to the swivel and my flies to the tippet I find I not only get less tangles, probably due to less line twist. I also place any split shot above the swivel and this helps keep the shot in place and prevents it from slipping down onto your flies. Watching other people fish, especially in waters that you are familiar with, can be very beneficial. Quite often I've observed anglers fishing runs or pools that I'm familiar with and thought to myself I've never thought fishing it that way, or from that side etc. Now instead of getting mad when I find someone fishing "MY" pool I watch for a bit to see how they do it, and secretly hope that me watching them will make them uncomfortable enough to leave! Learn at least a little bit about the bugs you are imitating, I'm not saying to become an entomologist but learning a little about the life cycles of the insects your imitating can help you immensely. The main insects of importance, mayflies, stoneflies, caddisflies and midges all have differences in preferred habitat, life-cycles, emergence patterns etc. Learn the basics of the ones important to your fishing area and it will help you to a better fly fisherman.